Building out a robust patient services program is a huge investment for any pharmaceutical company looking to support their patients throughout their treatment journey. It’s important to cover the basics (benefit coverage and access support, adherence program management, co-pay assistance, medication delivery/support), but how do you know if there are gaps in the support services your company is offering? If your prospective partner can’t produce these items, it’s not worth the risk. Any vendor partner that you choose to do business with should 1) make your life easier, and 2) make you look good in the eyes of your boss. If you have to hand-hold your partner through every step of the process, you will have trouble achieving either of these things; and it will adversely impact project timelines (and your sanity, for that matter). Choose a partner who speaks your language and has experience working in the complicated regulatory environment that is the reality in the pharmaceutical industry. If they’re not intimately familiar with the challenges that a patient services professional in your position faces, they’re hardly qualified to provide a solution. Did you hire your partner so that you could design your own surveys, figure out when and how to send the surveys, analyze the data yourself, and then figure out how to make the feedback actionable yourself? Of course not. Look for a partner who has experience asking the right questions, at the right time, to the right people to drive the results that your team needs to more effectively support your patients. Do you write the surveys? Do you have best practice questions? What does an average response rate look like? What feedback methodology would you recommend for my unique patient population? Do you analyze the data in-house? How do you make the data actionable? You are the patient services expert, but you partner should complement your functional expertise with strategic recommendations on how to maximize the impact of your real-time patient feedback program. Real-time feedback is only valuable if the feedback can be accessed in real-time. This makes a real-time, interactive reporting platform a must-have. A once-per-month Excel readout or PowerPoint report is not enough to effectively support your patients and get ahead of adherence risks. 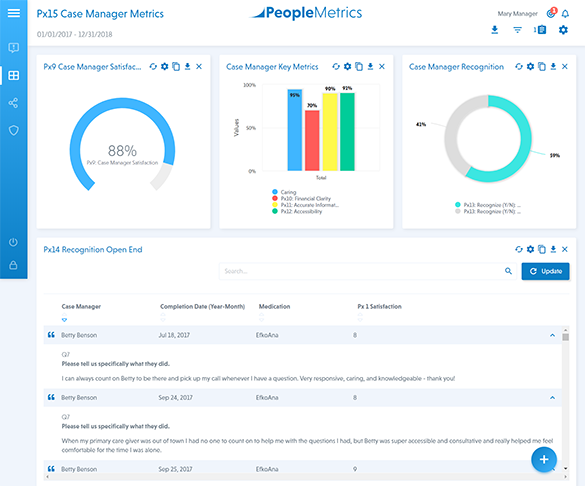 Your reporting platform should have the flexibility to see aggregate patient feedback across your company’s full portfolio in real-time, but also make it possible to immediately view and act on any single patient response (with respect to PII/PHI). The platform should be data agnostic and provide robust analytics and unique data cuts to get the core drivers of a great patient experience. If you collect data on what insurance provider a patient uses, you should be able to look at overall satisfaction cut by insurance provider, treatment location, medication, or any other piece of data that you collect without limitation. For organizations that rely on data to make strategic decisions, having the flexibility to pull data from disparate sources into a single source of truth provides the confidence that your investments in time and energy are supported by data. How many times have you been close to finalizing approvals from disparate stakeholders on a marketing communication or a questionnaire, when one stakeholder comes in at the 11th hour to change a word or question, forcing you to start the process all over again? Unfortunately, it happens more often than any of us would like it to. Working with a real-time patient feedback partner that is the right size, with the right internal processes to move quickly when changes are made will go a long way towards adhering to project timelines. You should never struggle to get a hold of your vendor project manager when it comes time to make changes or push the project forward. You should have a dedicated project manager who is intimately familiar with your program, who operates as an extension of your team, and is available when you need them. The patient services that your company offers to support patients throughout their treatment journey are specifically tailored to support the unique characteristics of your patient population. With this in mind, your real-time patient feedback partner is not a one-size-fits-all ordeal. Once your team has bought into the value of collecting patient feedback in real-time, it’s critical (like anything else) to do your due diligence and engage with the partner whose combination of the attributes outlined above most closely aligns with your specific needs and values. 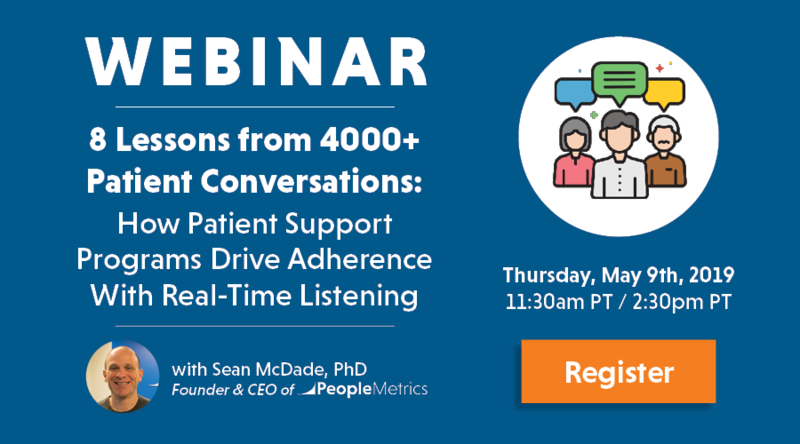 But first you have to take action, pick up the phone, and learn more about the value that a real-time patient feedback partner can bring to your organization. Want to know more about partnering with us? 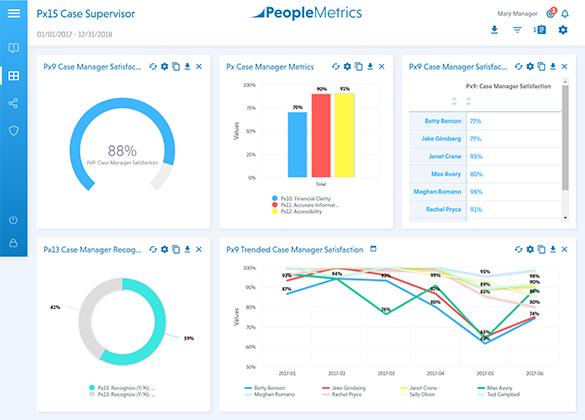 Matt Salvetti is the Sales Manager at PeopleMetrics. With a background in marketing and market research, he is passionate about helping organizations incorporate the voice of the customer and patient into strategic business decisions. Outside of work, Matt is a bit too passionate about the Philadelphia Eagles, Flyers, Sixers and Phillies. When not busy yelling at professional athletes on his TV screen, Matt is an expert at finding his way into (and sometimes out of) sand traps at his local golf course. Click here to get in touch.